Ollas (pronounced “oh yahs”) are unglazed terracotta jugs that are buried and filled with water. They work best with crops with larger root systems like cucumbers and squash. PROS: Easy to install and use, eliminates soil erosion, minimizes loss due to evaporation and reduces risk of plant diseases. Ollas are an ancient irrigation tool dating back to China over 2,000 years ago. They have been a popular watering technique throughout the world. Ollas are unglazed clay pots that are fired at low temperatures so that they are porous, allowing water to seep through the olla wall. The technique is simple and requires only a clay pot. 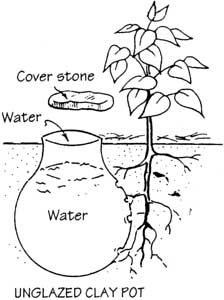 Soil moisture tension and plant roots create a suction force that “pulls” water from the olla. Water inside the olla is released more quickly when the soil is dry. When the soil is saturated due to rain, the water remains inside the olla. This prevents overwatering that can encourage disease and create anaerobic soil conditions. According to Native Seeds, olla irrigation encourages denser root growth and a more consistent water supply to the plant. As long as the olla and soil are not allowed to dry out, plants do not reach a wilting point. Weed growth is inhibited because the surface of the ground stays dry, preventing weed seeds from germinating during the dry season. The dry soil surface also aids in disease prevention. Harmful fungi that live in the soil are not splashed onto plant tissue. Olla irrigation has been more widely used in desert climates like New Mexico, but is not as common in the Pacific Northwest. Interest is growing here as evidenced by more online and hard copy DIY instructions for how to build ollas out of terra cotta pots. There are a few vendors in the Pacific NW that carry ollas. Dripping Springs Ollas sells their products at a few locations in Portland, OR and one store in Bremerton. They can also be purchased online. We purchased ollas from a nursery in Portland. We bought eight 2.9-gallon ollas that each measure 13 inches from the bottom to the lid and 12 inches in diameter. Dripping Springs also sells a medium sized olla that holds 1 quart of water and measures 9 inches tall and 5 inches in diameter. Ollas are recommended for use with annual plants and perennial plants that do not have large woody root system that may cause them to break. They can be used to water a newly planted tree or shrub, but need to be removed once the root system becomes established. Seeds that are planted around ollas require extra water to germinate and grow roots that are big enough to reach water under the surface. When burying an olla, a few inches of the neck is left above the surface so that debris does not get inside and clog. They can be kept in the ground over winter in climates that do not experience hard freezes that last for more than a week. According to Dripping Springs, as long as they are kept covered and clean, they do not need to be dug up and cleaned. Dripping Springs says that if an area gets about 30 inches of rain annually and summers are dry, they may not need to be refilled for 5 to 7 days. If it rains during the summer and mulch is used, they may hold water for up to 10 days. Soil texture and what type of plants are grown will also impact how often refilling is required. To tell when it is time to refill, you simply open and lid and look. Sometimes you may find slugs have taken up residence inside the olla. It is easy to scoop them up and relocate them to where they won’t damage the plants. March 18: two volunteers helped dig holes and bury six ollas down the middle of the bed. It was still the rainy season, so the ollas were not filled. April 15: sowed ‘Sugar Daddy’ snap peas that had been started in 4 inch pots in March along the front edge of the bed. Sowed cilantro seeds next to row of peas at both ends of bed. May 4: hand-watered. We continued to hand water the small transplants as needed until the ollas were filled. We needed to water often due to high temperatures and lack of rain. June 15: planted a row of cucumber transplants along the back of the bed along the freeway. The plants were grown from seed in soil blocks on June 1. June 17: planted six hot pepper transplants around each olla at both ends of the bed. The transplants were started indoors in March and hardened off before planting. June 18: planted lettuce transplants that were started indoors and hardened off between peppers and fennel. July 15: harvested fennel and lettuce. July 20: planted more lettuce transplants that were previously started in soil blocks around the four middle ollas where the fennel and lettuce grew. Removed pea vines from front of bed. Let cilantro that had not been thinned out earlier go to seed. July 24: sowed chard seeds in front of bed where peas had grown. After getting everything planted, we did not track how often we needed to refill the ollas until the latter part of July when temperatures reached the 90s. At that point, we found that we needed to refill the ollas every 3 to 7 days. We tried to keep the ollas continuously filled above 50%, but on at least one occasion they were a quarter full or less when we checked them. The inconsistent topping off of the ollas may have allowed the soil to dry out more than was optimum for some of the plants. We also neglected to set up a tracking sheet that everyone could use as we did for the other trials. Only a few volunteers ran the irrigation systems in the other beds and recorded the date, time, number of gallons used and number of minutes it took every time they watered. Different volunteers checked on the ollas and we did not set up a way to keep track of when they were filled and how much water they needed to add. The cucumbers were the most successful of the crops we grew. The fennel and first lettuce plantings had already sized up enough by the end of June that they did not suffer the impact of the high temperatures that we experienced in July. Some of the bean leaves showed signs of sunscald and the plant furthest from the olla flagged. The cucumbers grew rapidly and were very productive. We harvested the first cucumber on July 5 and are still harvesting cucumbers in mid-September. Some of the success might be attributed to the variety planted (‘Corinto’). The ‘Flaming Flare’ hot peppers thrived despite receiving a little less sunlight than the jalapeno peppers planted at the other end. A few of the jalapeno pepper plants flagged a bit in July and August and received extra water as a result. The lettuce transplants never sized up enough to go without supplemental water and could not tolerate the heat despite being described as “heat tolerant” varieties. The early pea plantings that were followed by chard were too far from the ollas to reach the water. In the future we hope to investigate how well chard, tomatoes and brassicas will do when irrigated with ollas. We also buried large ollas in three other locations in the orchard. These sites were not raised beds. We added a little vegetable fertilizer to the planting holes for plants described below, but did not test the soil for nutrients or amend with compost before planting. Pumpkin & Sunflower: two ‘Winter Luxury’ pumpkin transplants and 1 giant sunflower transplant were planted around an olla on May 15. The area was mulched with straw. The site is in full sun. The plants grew quickly and appeared healthy until mid-August. Only one pumpkin on each plant grew to maturity despite lots of flowers and pollinators visiting them. The fruits were very small (approximately 1 pound each) and matured so quickly that we harvested them on August 30. The sunflower showed signs of flagging but grew tall and produced a cluster of flowers by September. Insufficient nutrients may have contributed to the small size of the fruits, but we suspect that the ollas did not supply enough water to grow the pumpkins to a larger size. Peppers and Winter Squash: two winter squash transplants and six hot pepper transplants were planted around an olla in mid-May in an area in the back of the orchard that receives quite a bit of heat. We grew peppers there successfully last year. One of the squash plants was damaged by a rodent early on but grew back quickly after a piece of cardboard with a little Tanglefoot was placed on the soil around it. Some of the pepper plants wilted past the point of being able to revive them, and before they were able to produce any fruit. Only one of the squash plants produced one fruit and it was also very small though it appeared healthy and edible. We suspect that the peppers may have been planted too far from the olla to reach the water. There may also be some soil issues that call for further investigation. Perennial collards: two perennial (or tree) collards were planted the year before near the fence. We buried an olla between them. Perennial collards are fairly drought tolerant. They did not show any signs of flagging throughout the season, but they did grow more slowly than the original plant they were propagated from.